okay, so i am a tad bit addicted to etsy's pounce feature. it is just so much fun to discover new and lovely shops! here are some shops who haven't had a sale yet! check them out and support! how amazing is this packaging for laundry soap? i want it! I LOVE those pinwheel earrings...too bad they're out of my price range. I'm with Lindsey. Those pinwheel earrings are super adorable! It is so nice of you to feature shops that haven't yet had a sale. I can bet that they appreciate it!!! Thank you so much for featuring my earrings on your blog! Thanks for the nice comments too! I'm new to Etsy, so this is a nice surprise! There are pinwheel rings coming soon too! 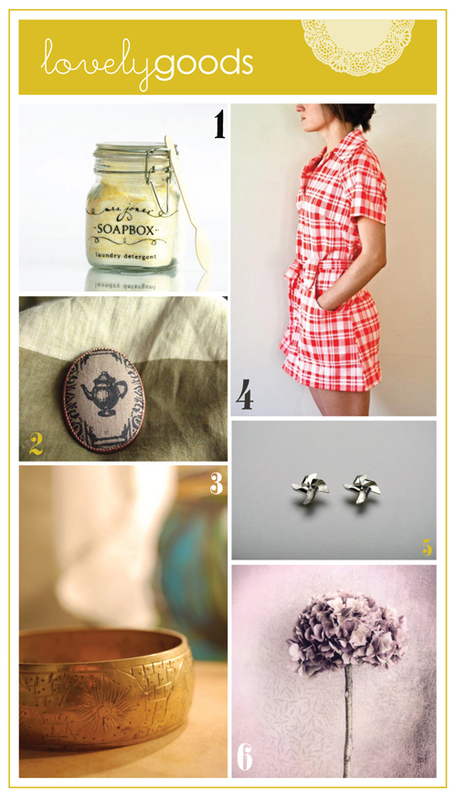 How nice to see my little teapot pin on your blog! I love everything it's grouped with too! Both of my teapot pins have since sold, but more are on the way. Thanks again! I love your blog and am excited to read more!